After the excesses of Christmas and New Year feasting, I really want to make and eat meals which are less rich. So why don't you, I hear you say? Because the fridge is still full of Christmas and New Year food and as I cannot bring myself to waste food, we are going to have to eat it all up! This compulsion is generally kept under control by careful menu planning to ensure that there is only what is needed in the fridge and cupboards. However, over the holiday season all this goes out the window and when I open the fridge I am staring at various half eaten packs of cheese, vacuum packed chestnuts and boxes of left over meats and vegetables which demand to be re-purposed into delicious thrifty meals. Unfortunately, they don't tend to be low fat or low sugar type foods so I'm hoping I will have cleared the lot by the end of the coming weekend and I can eat in a more healthy way once more! 1. Heat the sunflower oil in a large pan, add the chopped onions and celery and cook on a medium heat until the onion is soft and transparent and the celery has started to soften. 2. Add the stock and simmer gently for 10 minutes until the celery is soft. 3. Add the cauliflower in cheese sauce and cook for a further 10 minutes. 4. Take the pan off the heat and leave to cool for about 20 minutes. 5. Puree the soup with a stick blender or in a liquidiser, adding some milk if the mixture becomes too thick. 6. Season to taste and garnish with parsley. It seems that others also suffer from the compulsion eat up everything left in the fridge, as the theme for January's 'No Croutons Required' is to come up with a creative vegetarian soup or salad making use of your leftovers. 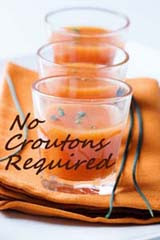 No Croutons Required is a blogger challenge alternately hosted by Lisa at Lisa's Kitchen and Jac at Tinned Tomatoes, this month Lisa is hosting. Sue - Good to hear I'm not alone! Dom - Thank you, I'm thrilled with your comment on the photo. Not a new camera but Lightroom software to process images and 'From Plate to Pixel' for food photography tips! Looks delicious and guilt free! Great idea. I think I will make that this week. Lovely soup and, yes, the photo is looking great! 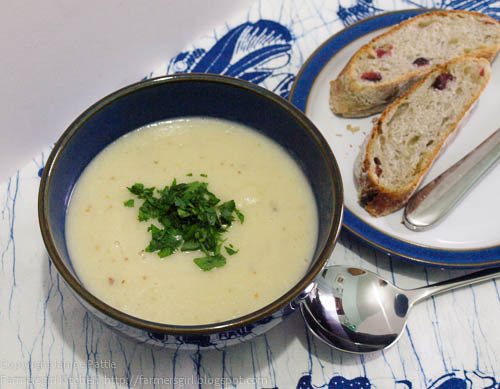 Love the flavours in this soup, what a fabulous entry into Credit Crunch Munch!